Sikkim now has India's second largest govt hospital! Sikkim now has India’s second largest govt hospital! Now, Sikkim has the second largest government hospital in India with the inauguration of an 1,002-bed hospital at Gangtok. 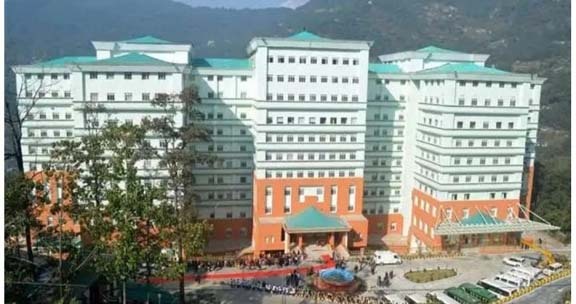 Sikkim Chief Minister Pawan Chamling inaugurated the New Sir Thutob Namgyal Memorial Multi-Speciality Hospital on Monday and claimed it is the second biggest healthcare facility in the country after the All India Institute of Medical Sciences (AIIMS) in New Delhi, reports The Telegraph. The foundation of the first government medical college was also laid at Sochaygang near here. It has been reported that covering 15 acres of land, the first phase of the Sochaygang hospital was built at a cost of Rs 830 crore. It took nine years to complete the construction of the hospital. The overall cost of the project will be Rs 1,281 crore, said the report. Delivering his inaugural speech, Sikkim CM Chamling said it was the landmark achievement of his government which has crossed 24 years. The main block of the government hospital, which can withstand earthquakes measuring eight on the Richter Scale, is a 10-storied building with a total built-up area of 46886 sqm. The main block has 13 lifts and houses all general, surgical and speciality departments and 23 different operation theatres. The 100-year-old Sir Thutob Namgyal Memorial Hospital, located in the heart of the capital, will be shifted to the new hospital by the end of this month, said Chamling. “The new hospital should be fully operational by February 1,” said Chamling. The report also said, the state government has already appointed 47 regular doctors and 261 nurses. The process of appointing super specialists, specialists and paramedics is also going on. The hospital is well-equipped with highly-sophisticated equipment, including MRI, CT scanners, orthopantomogram machine and Doppler fetal monitor. The hospital is located 3 km away from Gangtok town. The patients and attendants will be ferried by buses to be operated round the clock to and from the hospital free of cost. The hospital will provide free treatment to the residents of the state. The complex also has a 119-bed Yatri Niwas with a restaurant for attendants of patients where Sikkim residents will be given free accommodation and food, the CM announced. Earlier, Chief Minister Chamling laid the foundation stone of the first government medical college. The medical college will be constructed at a cost of about Rs 556 crore over 8.5 acres adjacent to the new hospital.